Published by Web Hosting Secret Revealed on August 1, 2016: Lori Soard, Author. Building trust with your readers is an important part of blogging. There are a number of things you need to do in order to build a blog that is trustworthy and a loyal following of readers who will not only return to your site time and time again, but will become loyal clients. In a recent interview with Web Hosting Secret Revealed, Kristine B. Snively, Founder & CEO of Pristine Public Relations, Inc., discussed a variety of ways to build trust with readers. Be honest. Always use credible sources and provide trustworthy links to those sources in your posts. If your blog appears high in the search engines, this is going to immediately build trust among readers. Google and other search engines reward websites for producing unique, quality content. Blogging on a consistent basis gives search engines new content to index, which will help raise your site’s ranking over time. A higher ranking means more traffic. Building credibility means being consistent over and over again and staying true to your site’s mission and your values. Use credible sources. Always use credible sources and provide trustworthy links to those sources in your posts. The worst thing a blogger can do is post information that is out-dated, inaccurate or simply not true. This is one of the easiest ways to build “distrust” with your readers. Linking to credible sources does a couple of things for you. First, it shows your readers that you aren’t the only one that believes this to be true. Second, it keeps you accountable. If you have to prove your point with a source, you are more likely to make sure that fact is accurate. Develop authority in your area. If you are seen as a leader in your niche, readers are going to automatically trust you more. Becoming an authoritative source in your industry takes time and hard work. Producing quality content consistently over time is an excellent way to achieve this. No matter your business type or size, you can build trust with your customers by providing valuable information in your blog posts. When it comes to blogging your biggest challenge will be gaining a loyal following. To do this, make the content genuine, useful and interesting for readers. Inject your personality into every post. For example, if you are blogging on a particular topic, along with the tips you are proving readers, remember to share your opinion, your personal views and experiences. Showcase the media outlets, popular blogs and sites your content has been featured in. This can include interviews, guest blogging spots, awards, and any expert panels you have been on. Showcase these accolades in the sidebar or footer of your website. This will help establish you as an expert in your field and build credibility and trust among your readers. As always, writing in-depth content that offers value to the reader is the best way to keep readers engaged and turn them into customers. Creating intelligent well thought out content. Posting on forums where intelligent people hang out. Read the comments to see how smart the discourse is. Seek out other smart people to recommend your site to others. Although you don’t have to have an education to be smart, you can narrow your target audience to those with degrees or advanced degrees for the purposes of advertising. Put content out that will have value both today and tomorrow. This alone will ensure that you attract readers who want to read smart articles. Gather testimonials and reviews. When it comes to building trust online, reviews and testimonials from others is something that people do consider. 63% of customers report that they are more inclined to make a purchase if the site has user reviews. Consumer reviews are trusted about 12 times more than a simple description from the manufacturer. Display testimonials prominently. When site visitors see these, it provides you with immediate credibility. Remember to always request these from happy customers and clients. Add a profile picture. Not only will readers feel like they know you when they see your photo, but they will instantly recognize you other places on the Web, such as social media sites or when you guest post on another blog. Include an “About” page. Offer details about why you started the blog and what makes you uniquely qualified to write on this topic. Go ahead and let your personality shine through on your About page. If you have a great sense of humor, add some funny stories to your bio. If you’re more serious, then keep to that general tone on all your pages. Inject your personality into every post. For example, if you are blogging on a particular topic, along with the tips you are proving readers, remember to share your opinion, your personal views and experiences. In fact, one of the worst mistakes you can make is trying so hard to look “professional” that you don’t share your personality. Let readers know who you are and inject this into your posts. 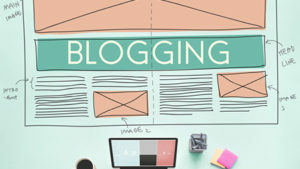 Blogging allows you to show a more personal side of you business, connecting with potential new customers while maintaining existing relationships. Always communicate. If a reader takes the time to visit your blog, read your post, and then comment on it, you should take the time to respond to that reader. Respond to reader comments. Readers who post positive comments on your blog appreciate your content; let them know you appreciate their feedback. You can do this in one line and it will mean a lot. Designing custom blog sites for our clients is one of our specialties. In fact, we blog every day for some of our clients! We offer custom blogs, website redesigns and professional web solutions for every size law firm. Most of our designs are WordPress, allowing clients the ability to make changes themselves and update as needed without having to know complicated HTML code. If you have any questions on this topic or would like to hear how the latest media, marketing and technology strategies can help grow your law firm, contact us TODAY at (954) 376-3683. Also serving Central Florida and surrounding areas at (407) 982-1707.